Will the ancient sword go back to its rightful place? 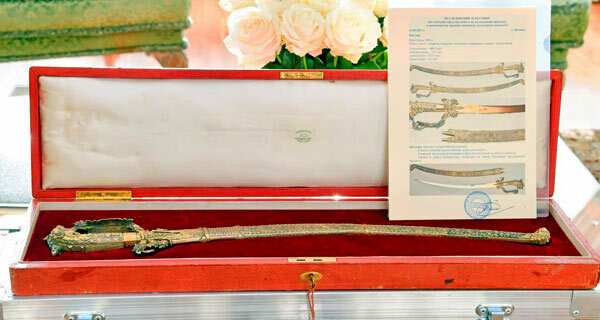 The ancient sword belonging to the Kandyan era presented by the Russian President Vladimir Putin to his Sri Lankan counterpart President Maithripala Sirisena will be handed over to the National Museum, sources said. President Sirisena received the sword in an official visit to Russia where he held bilateral discussions with the Russian President in Moscow on March 23. The sword was believed to have been taken to England back in 1906 later been bought by Russia at an auction. However when contacted, the Department of National Museums Director Dr. Sanuja Kasthuriarachchi said so far she was not informed about such a move and could not estimate the value of the sword without observing it carefully. Meanwhile, she said that the Kandy Museum which, was closed for over one year for renovations is to be opened on April 3 under the patronage of Minister of Internal Affairs, Wayamba Development and Cultural Affairs S. B. Navinne. It is also believed that the sword might be transferred to the Kandy Museum once it is reopened. 2 Responses to Will the ancient sword go back to its rightful place? now sirisena has something to wield to support his tongue lashing. This relic that putin gifted to sirisena does not look like a sri lankan. The sort of stuff that elara and dutugemunu battled with were forged crude and most weapons did not go beyond the “keththa” a hybrid detween the “manne” and the axe The craftsmen were not capable of even designing a durable handle. Well, it is sad to note that the museums are the most unsafe places to keep and display our ancient artifacts. There were more than three recorded thefts in Colombo museums . We killed a Buddhist monk in Naga Vihara Kotte to rob a sward. We can’t protect our national heritage, we can’t protect our biodiversity. Hope the sward will be safe in Sri Lanka.